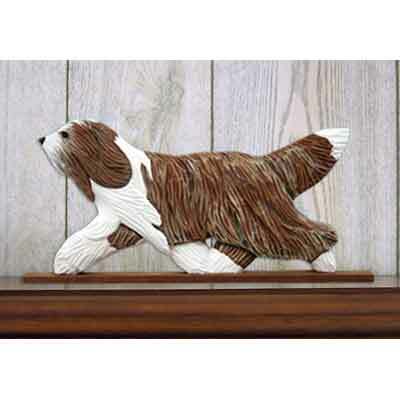 Beautiful hand crafted Dog in Gait Door Topper featuring a resin dog breed reproduction of an original wood carving by Master Woodcarver Michael Park. This cute Dog in Gait Door Topper will enhance any Dog Loving home decor. Each dog is hand-painted in breed specific colors of your choice. Can be mounted on a door, window sill, mantle, computer or any space you want to share with your best friend! This beautiful door topper will definitely show your love of dogs no matter where you place it. Makes a great gift for the dog lover in your life! Ships direct to you by our woodcarver, please allow 10-14 days delivery time. Please order prior to December 1st to insure Christmas delivery.